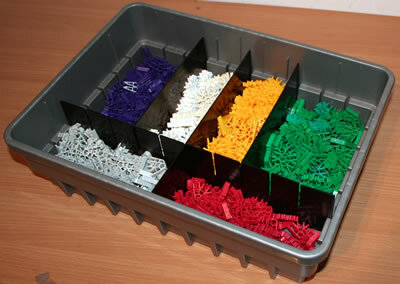 Chain links are available in many K'NEX sets. They may be joined together to make a long flexible chain, as shown in the photo. Chain is very useful for transferring rotary motion from one part of a model to another. It has two advantages over pulleys and rubber bands, in that chain rarely slips, and that a chain can be created in any length. It is important to note that there are two quite different sizes of chain link, as shown in the photo. The larger classic K'NEX Chain link is 32mm long. The smaller Micro K'NEX Chain link is 20mm long. 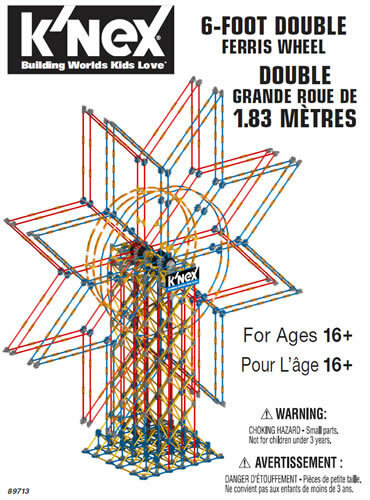 Please bear this in mind if you are buying Chain link from our K'NEX shop. 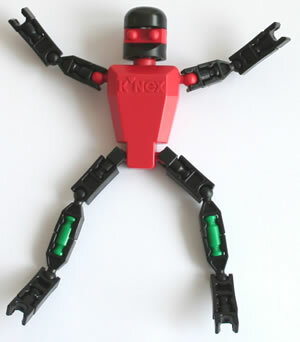 The best way to use classic K'NEX chain with 32mm links is to connect it between two pairs of yellow or red gears, as shown in the photo of a chain saw model opposite. The best way to use the Micro K'NEX chain with 20mm links is to connect it between a pair of "Sprocket" gears, one of which is shown in the photo opposite. The K517900 Sprocket gear is actually black, but it shown as grey in the photo to help differentiate it from the chain. 1. 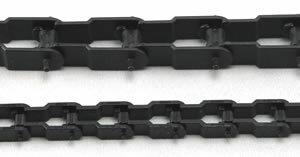 For maximum chain flexibility, it is important to ensure that when you connect your chain links together, you get them all the same way up. 2. The photo opposite shows a black Chain guide attached to a length of Micro K'NEX Coaster track. The guide helps to ensure that any Micro K'NEX chain used to raise the car to the top of the track runs centrally along that track. 3. K'NEX chain needs to operate under a reasonable tension for maximum effect. If this cannot be achieved by modifying the number of chain links, you may like to try running one side of the chain behind a K'NEX rod carefully positioned as a "tensioning rod".